Hey Ladies, last week I had the BUSIEST week of my entire life. By time the weekend rolled around, I was sooooo drained. Normally the weekends are my most productive times, because I have hardly anything to do, or have any commitments. However that was not the case. So in an effort to motivate you, as well as myself for a very productive week (because we have things to do and accomplish this week!). My first piece of advice is to make a TO DO List. I know this sounds childish and minimal and whatever. BUT when I feel extremely overwhelmed with work, I always make a list. Now the downfall of this is, you may find that you have more work than you initially anticipated, however sometimes you have less work (I live for those days). So, I always attempt to make my list due date based. So the things that are immediately due go first, and then next week, and so on and so forth. 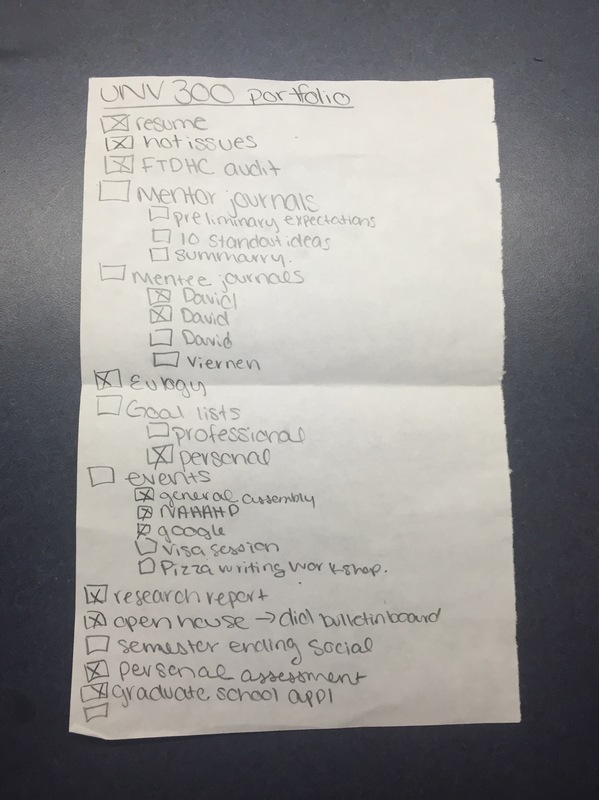 I also sometimes have to have multifaceted list, for example if I have a project to do, and it requires a lot of little pieces, I will list those things under the initial task (see picture at the bottom for an example from last semester). It may seem OCD, but would you rather forget to do something, or a project? Exactly, no one wants to forget anything. The greatest feeling in the world is marking off something you have done or a task you have completed! You can mark it with a sharpie or highlighter, or check the box anything. An alternative to TO DO lists, would be to purchase a planner (my planner picture is at the bottom as well), which essentially you would put your TO DO List within. So you could follow the same tips. Only thing is remember to actually look at your planner. Don’t just write something down in it, and then never look at it again. I often have that problem with my planner, thats why I use both a planner as well as lists. 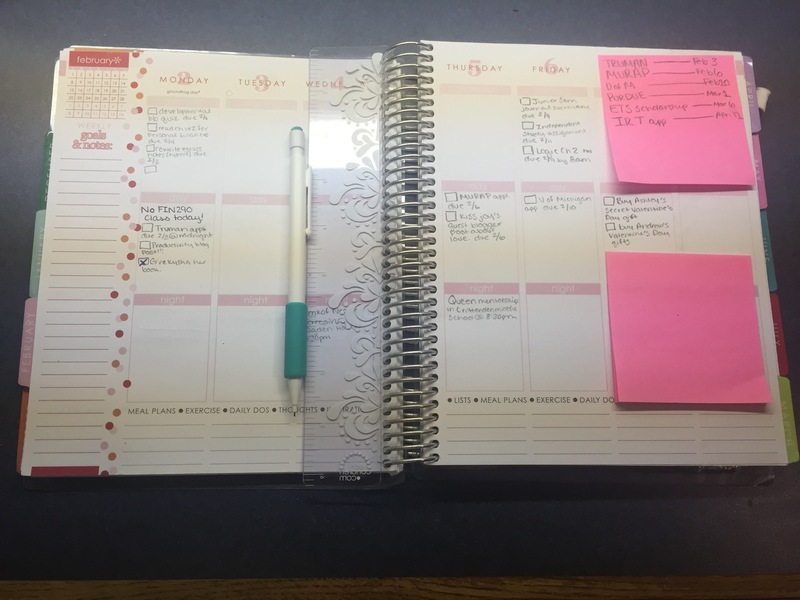 As my best friend once said, “there is no way you can be organized and successful without one [a planner].” I personally use an Erin Condren Life Planner, and I ABSOLUTELY love it! There are tons of ways to personalize it, and use it in different manners. This planner is great for anyone! Work in a productive space. Beds are not productive spaces for me, so I know never ever try to get work done there. But for you, it maybe where you work the best! My ideal productive space is working at a desk in the library, or my desk, or in my department’s office (as long as its clean with minimal distractions), with my homework playlist bumping in some headphones, with water and my TO DO list, at any time of the day after 10:30am basically. Your productive space may be in the middle of the night, in your bed, in complete silence. Everyone’s productive space is different. Some people can work in clutter, while others absolutely cannot. It takes time, but you should be able to learn where YOUR productive space is, through trial and error. Next thing I would suggest is to work on the hardest thing first (if you don’t work by due dates, or you have multiple projects and assignments due on the same day). I know this seems backwards, but doing the biggest and hardest assignments first, make every other assignment seem super easy. You will be breezing through all your other assignments. Trust me! Give yourself breaks. You cannot work for 6 hours straight without any breaks. So for every 2 hours I work consistently, I will give myself a break. Maybe a break for a snack, stretch, walk arounds, social media, or anything thats a reward. Our brains need time for our neurons (the cells that make up the brain) to make connects with other neurons, and also if you reward yourself with something (whatever makes you happy) the brain is more apt to remember it. Some brains function better on a reward based system most of the time, however everyone’s brain is as unique as they are. Don’t give up. Being productive takes time and practice. It’s just like a muscle in your body, you have to use it and push it to its breaking point to get stronger, the same goes for productivity. You have to work extra hard, even when you don’t want to, to make your productivity muscle stronger. I hope this helps you get on the right path of productivity! Feel free to leave your productivity tips in the comments as well! Your tips are all 100% spot on. I found my most productive space to be my own room, distractions and all! Finding a space that’s both productive and comforting can really make a world of difference.